Each week Don Letts of Radio 6 selects a piece of Crucial Vinyl (he calls it his C.V.) from his collection, that has moved him and shaped his musical taste. He picks three tracks from it, and explains why it means so much to him. This week, it’s the 1979 debut by the Specials. 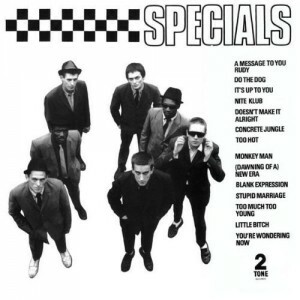 Don says, “The release of the Specials’ self-titled debut album was key for the UK ska revival. This was music made by the people for the people, and, for a brief while, it was all about 2 Tone. Produced by Elvis Costello, and fuelled by the energy and attitude of punk, the band re-worked original 1960’s Jamaican ska. Too Much Too Young was actually a version of an earlier hit called Birth Control, and there were also straight-up covers: Toots and the Maytals’ Monkey Man and Dandy Livingstone’s A Message To You Rudy. As ever, Don’s other selections cross time, space and genre. Hear the whole show here – http://www.bbc.co.uk/programmes/b0546p3k. Don’t leave it too long as it only stays on-line for 4 weeks! What is it like to be in a Tribute Band? What Do People Want From A Tribute Band? Why Do Bands have to Bicker after Splitting Up?